Care Chrome plated, powder coated and glass elements in addition to all table tops should be cleaned with a damp, light cloth and subsequently dried. 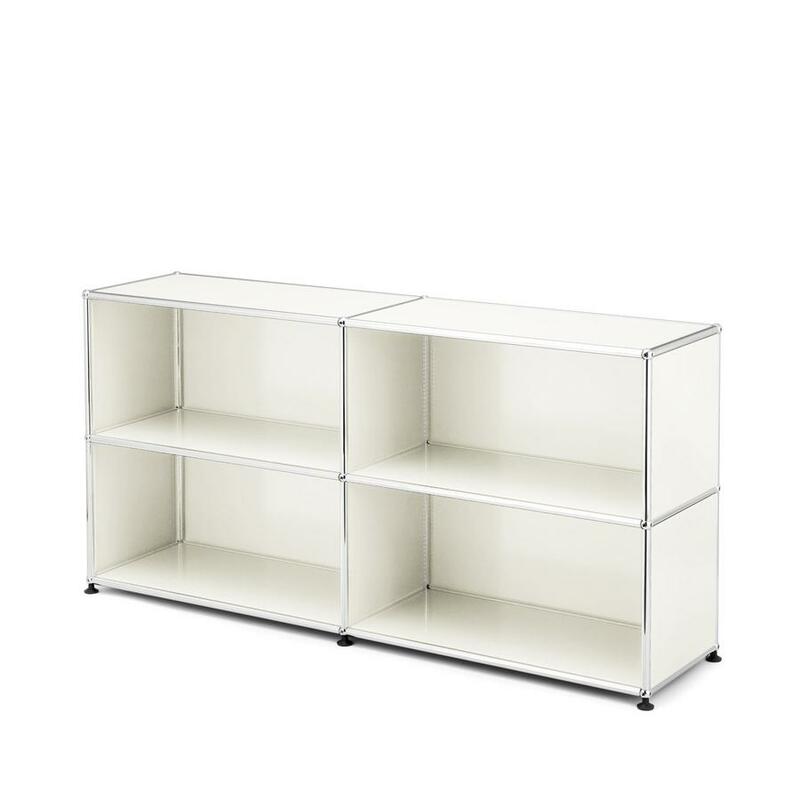 Can you mount wheels on the USM Sideboard? Are castors with or without brakes required? Castors for the USM Sideboard can be ordered in our shop. For all USM units the use of two lockable castors is to be recommended, a total of 6 castors are required for such a sideboard. The castors are available in two hardnesses: soft variant for wood floor and a hard version for carpeting. Are USM units available in special, custom, colours? Custom colours are available from USM, but because the production is very complex they are only available for bulk orders. Can a glass plate be mounted on the sideboard? Yes. However, this requires the use of additional counter pads, which are screwed into the brass connector balls. After Fritz Haller had planned new buildings for USM, he received another commission from the Swiss metal fabricators: interior furnishings for the office pavilion. 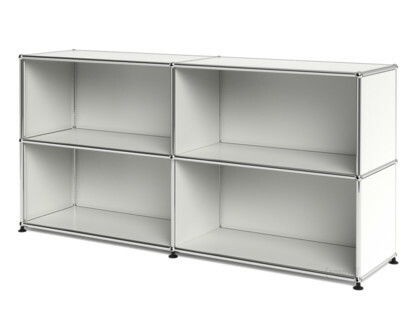 The result was the USM Haller modular furniture system, a shelving system that sets new standards in modular and function-oriented design The series production of the USM Haller shelving system began in 1969, after USM Haller was requested to provide units for the Rothschild Bank, Paris. A central philosophy behind the USM Haller system is that "furnishings are not a state but a process." Based on a relatively small number of components USM furniture allows maximum flexibility, and objects which can be reconfigured at a later date if required. 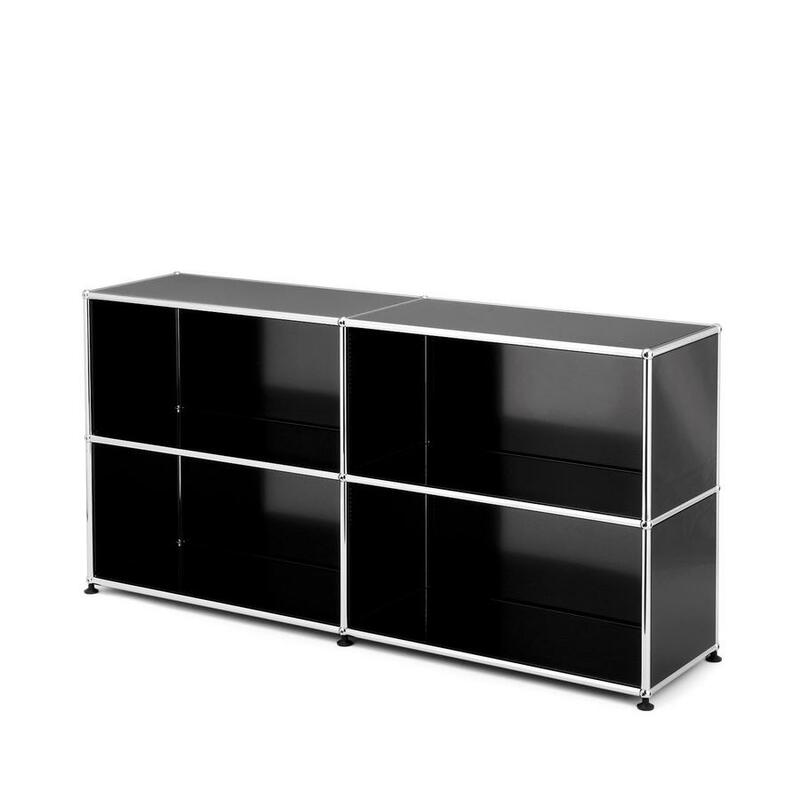 The USM Haller sideboard with four open compartments is one of the simpler versions of the furniture system and can serve as a discreet storage solution in various locations, commercial or domestic. Located in the Swiss town of Münsingen USM's company philosophy highlights ecological responsibility in the entire production chain. 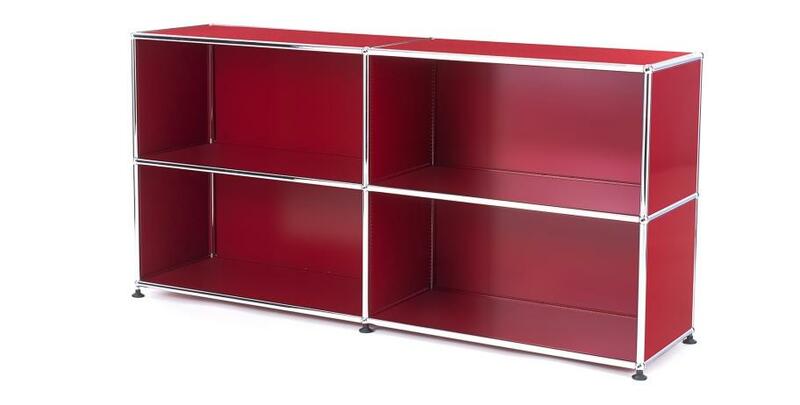 A great assistance in this is the served by the design of the USM Haller modular furniture system: the versatility and exceptionally long product cycle meaning that one need, in principle never replace or throw out a USM Sideboard! A USM Sideboard consists of a few, high quality materials, such as chrome-plated metal pipes and brass balls. The metal panels for cladding are painted using a modern powder coating process, which not only produces a relatively scratch-resistant surface colour, but is also considered environmentally friendly. In 2008 USM Modular Furniture were also awarded the Greenguard Indoor Air Quality certification for low emission products. The designer of the USM Haller furniture was actually an architect and the USM Modular Furniture his only commercial furniture. Born in 1924 Fritz Haller trained as a carpenter, draughtsman and architecture. A particularly strong influence on his work were the functionalists Willem van Tijen and Berend Bakema, with whom he collaborated in Rotterdam. His functionalist architecture understanding went into the planning of many types of buildings such as schools, office buildings and factories, and manifests itself repeatedly in a clear, minimalist structure. 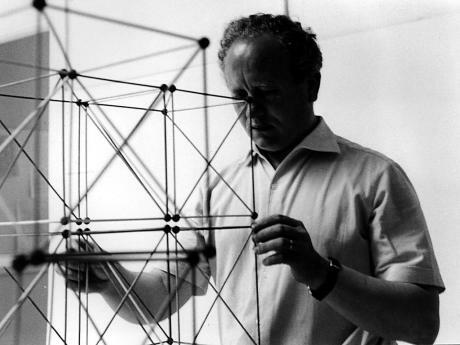 Fritz Haller's collaboration with USM began came in 1961, when Paul Schärer commissioned him to build new production and administration building. In 1963 he then developed a furniture system for the USM office pavilion - and System USM Haller's long journey to global fame began. As with his buildings Fritz Haller's modular furniture system is marked by a clear structure even in complex constructions loses nothing of its simple, reduced appearance. 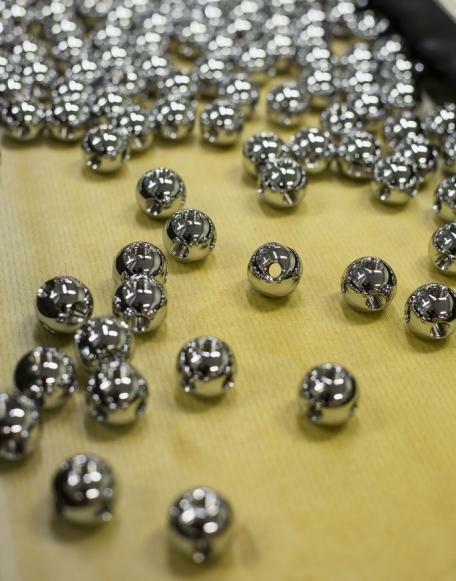 The chrome plated brass balls serve as connecting elements in all USM furniture. Central to the definition of Fritz Haller's work is the concept of functionalism, whose origins go back to the 19th century. After the heyday of functionalist principles in design and architecture during the Bauhaus era in the 1920s, functionalism dominated postwar form giving and creativity. Functionalist buildings and furniture were, then as now, extraordinarily modern, timeless and elegant creations. USM Haller furniture closely follows one of the central themes of functionalism, Louis Sullivan's famous "form follows function"in that the form can be adapted to meet changing functions. In addition the clear construction and lack of decoration is pure functionalism. And a central reason why today USM Haller furniture is just as popular in homes as in offices. With the creation of a hardware and locksmith's business in the Swiss town of Münsingen in 1885 Ulrich Schärer laid the foundation for USM Haller. More or less. It was not however until Schärer's grandson, Paul Schärer, began co-operating with local architect Fritz Haller in the 1960s that the story develops into the product we all know today. 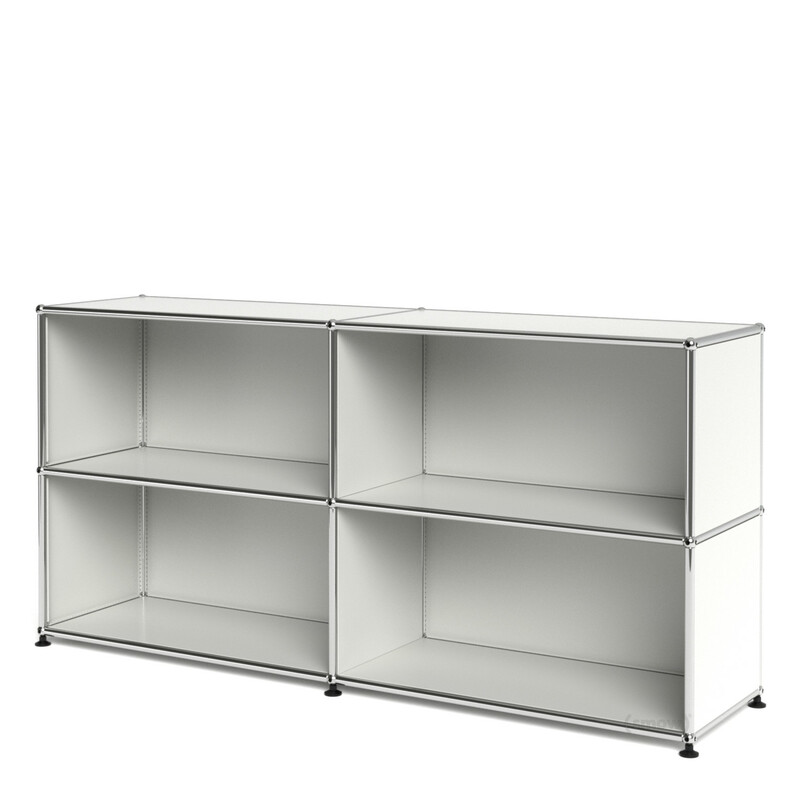 Originally designed by Fritz Haller for use in the USM offices the shelf system quickly became both the the principle product of the company. And a furniture design classic. 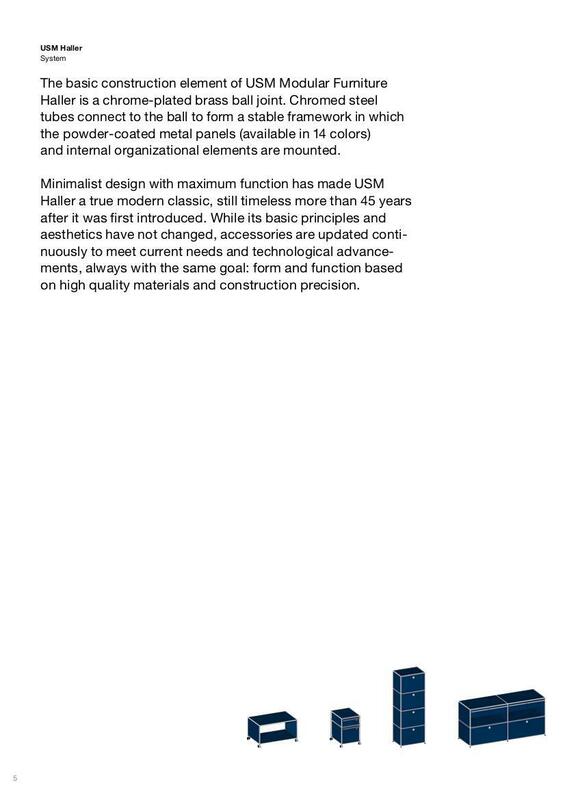 As an indication of just how important USM Haller furniture is in 2001 the system was added to the permanent collection the MoMA in New York. 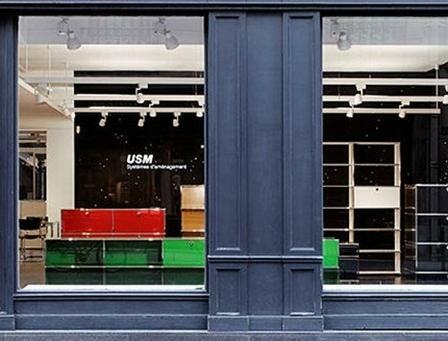 The USM Showroom in Paris was opened in 2003.